Western Wedding Ideas - Grab Your Cowboy Hat, and Let's Get Married! Western wedding ideas offer the perfect ingredients for a country wedding that every cowboy and cowgirl will love. Even if you don't live in the Wild West or the South, you can still have a country western themed wedding. Not only are western weddings fun they allow you to show off your creativity, and they make your wedding stand out from the rest. There are several essentials for the perfect western wedding, and listed below are our favorite western wedding ideas. You may want to bookmark this page since there is a lot of information here. Locations for a western wedding include old barns, country inns, historic country homes, historic country churches, ranches, horse farms, rodeos, country-themed restaurants, western-themed resorts and old western villages. Community halls and other public reception sites allow for easy decoration since they usually have neutral colors and furniture. If you live in the country choosing a location should be relatively easy. Do a search or ask around local towns about possible locations. Consider having a Western destination wedding. Have your guests join you for a weekend filled with country food and western atmosphere. Locations to consider include Nashville, the Grand Canyon, old-west towns, western-themed resorts and hotels, theme parks and ranches. It all starts with the save the dates and invitations. Send them out early to let your guests know that you will be having a western-themed wedding. 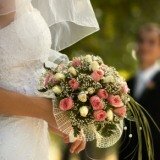 Visit country wedding invitations for some great western wedding ideas. Western wedding programs are the perfect start to your wedding reception, and they help set the tone for the rest of your wedding day. Encourage guests to wear western-themed outfits to your wedding. This really helps to set the theme of your wedding, and it encourages everyone to be involved even if this isn't their thing. Western wedding dresses are very beautiful, but it is OK to wear a traditional gown if you want to. For a western touch consider wearing cowboy boot wedding shoes and a western wedding hat. The groom and groomsmen always look stunning in cowboy hats. Even if you don’t want them to wear them for the ceremony, you can still have them wear the hats for photos and at the reception. Saying your vows outside in a garden is a great way to go. If not a country church or other religious locations can be beautiful as well. For transport to your ceremony and reception, consider renting a horse drawn carriage, or if you are really daring ride horses from the ceremony to the reception! Many people think of gambling when they think of the Old West. Rent gambling tables for the reception, and have prizes to give away for winners. Many companies offer packages that come with the tables that include staff and prizes (completely legal of course). Rent a mechanical bull for the day. They are usually good for hours of fun, laughter and incriminating photos. Decoration ideas include bales of hay, saddles, old wagons, cowboy hats, cowboy boots, tumbleweeds, rope, horse shoes, sheriff’s badges, spurs, cactus and wagon wheels. These items make great decorations, and they can be used in the background of your photos as well. As a surprise right before your meal is served, have someone ring an old fashioned dinner bell when it is time to eat while yelling "Come and get it!". Tie cactuses into your arrangements and centerpieces. 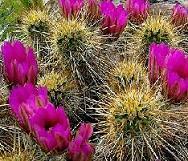 It's even better if the cactuses are in bloom. Choose flowers that are in season and local to your wedding location. Garden wedding flowers work very well for this wedding theme. For centerpieces consider having flowers planted in old cowboy hats, boots or other unique western containers. Other items can be combined with flowers, including horseshoes, cowboy hats and those listed above under reception ideas. 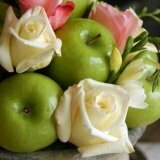 Work with a good florist to come up with some unique ideas. Find a caterer that specializes in country cooking and western wedding ideas for your reception. Many people think barbeque when they think of country western wedding ideas, and you can have some fun with the menu. Don’t limit yourself to traditional wedding reception food if you don’t want to. If you want an open pit barbeque or pig roast, then go for it! No theme is complete without a cake. Western Wedding Cakes has some fun ideas for your western wedding. Entertainment is very important for a western wedding. Start looking early for a western band that is versatile enough to play new and old classics to get your crowd moving. DJs have the advantage of being able to play any song new or old, and they can also interact with the crowd. Either way you want to hire a DJ or band that specializes in Western-themed weddings and events and not someone that will only be pretending for a day. What western wedding is complete without country line dancing? Have a dance instructor come in for the first hour of your reception to teach your crowd how to line dance. Many DJ companies offer this as well. At your reception, have a photographer take black and white photos of your guests dressed up in old-time western wear. These make great favors, and your guests will have something to hang on their wall that will remind them of your wedding. Other western wedding ideas for favors include filling small ceramic cowboy boots or hats with your favorite candy, planting a cactus in a pot for each guest and having personalized barbeque sauce, hot sauce or miniature whiskey bottles to give out. Consider having a signature drink at your reception, and call it Moonshine. If all else fails serve a drink with Whiskey in it, or give it a unique western name.